Who Invented the TV Dinner? Everyone loves a good fad. Popular fads run from hairstyles to clothing to colors to hula-hoops. Right now we will look at fads in food over the years. The first food fad that comes to my mind is the TV dinner. When television came out in the mid-fifties folks found they were spending too much time in the kitchen away from the tube. They could miss part of the "Texaco Star Theater" or "The Honeymooners". Perish the thought. I think it was a fellow named Bird's Eye or maybe Swanson who invented the TV dinner. The dinners (or suppers or breakfasts in later years) came in a stamped aluminum tray. All you had to do was stick it in the oven for a while, and your meal was ready. 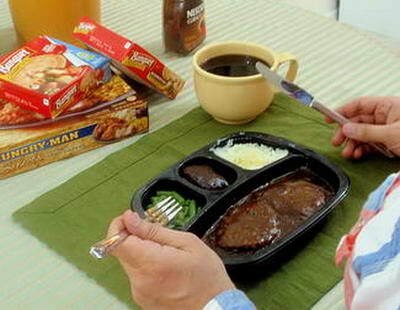 TV dinners had: some sort of meat, usually meatloaf, a helping of mashed potatoes, some corn and a "dessert". For special occasions, there were turkey dinners with a bit of dressing and gravy, fried chicken dinners and the Mexican dinner. The Mexican dinner had: a tamale, an enchilada, some rice, chili sauce and cheese. These were pretty good. The TV dinners led to TV trays, which were for holding the dinner and your drink. Someone had the great idea of putting legs on the trays and making them fold. Great invention. I think I still have one or two of those around. Today, ninety percent of what Americans eat has evolved from the simple TV dinners. You can get about anything you can think of (and a lot of things you would never have thought of) frozen for your "home cooking" enjoyment. I like instant coffee. I seldom use it as most of my friends have become coffee snobs. They will not touch coffee that is over 45 minutes old. Heaven forbid they should get some coffee that has been reheated. They really like the Starbuck's crappo frappo latte that runs five or six bucks a cup and really isn't coffee but a kid's breakfast drink. Real, he-man coffee is made by boiling coffee in an old bucket of creek water and then breaking an egg in it to settle the grounds. It will wake you up. The popularity of chili took a nose dive after the Great Depression when it saved a lot of lives by being available for ten cents a bowl along with crackers and ketchup. With the economy on a steep rise, everyone went for the more respected items. However, there were some diehard chili friends who worked at popularizing chili. They started the chili-cooking contests and generally kept chili in the news. The chili craze peaked in the early eighties, but it is still a staple in a lot of diets. However, until someone comes out with a good microwave chili, it will be for the few faithful. The chili wars made many people aware of the mysterious element, capsaicin, which produces the heat in chili peppers. If not too pronounced, the heat produces a pleasant sensation when consumed. People have been consuming chili peppers for thousands of years. The capsicum plant native to Texas is the chile petin, or Bird's Eye pepper. They are small, hardly larger than a match head, but pack a lot of heat. All early Texas tables had a bottle of chili petins in vinegar. For years the only commercial hot sauces available were the Tabasco and the Louisiana Hot Sauce. They are really all you need, but some bright thinker decided the world needed more flavors of hot sauce. In a year or so, there were hundreds, if not thousands, of flavors and brands of hot sauce on the market. The only one I have found that I pay money for is the Scorned Woman hot sauce. It's just my style. Barbecue has been around for a million and a half years or so. Here in the States, before WWII, barbecues were big productions, usually by some lodge or other organization, as a way to raise money, or the well heeled threw barbecues to feed the big crowds they hosted. After WWII, Americans started backyard cooking. Barbecue was the most popular fare. It usually meant some hamburgers and hot dogs on the grill. When the 55-gallon barrel smoker came along, folks were capable of making real barbecue in small quantities. The thing that separates barbecue from smoked meat is the barbecue sauce. Meat cooked dry, with smoke, is smoked meat. When sauce is added during the cooking process, it's barbecue! Most barbecuers had or have their own private recipe sauce. They take a bottle of ketchup and add things until they have sauce. The first commercial barbecue sauces I remember are Kraft, Heinz and Cattleman's. They were all tomato based, sweet and sour. The Kansas City area is chiefly responsible for popularizing various flavors of barbecue sauce. In about 1977 , Dr. Rich Davis started experimenting with "muchup," a mix of mustard and ketchup. These experiments led to the Kansas City Masterpiece sauces which are today's biggest sellers. Karen Putman, also of Kansas City, developed the first fruit-flavored barbecue sauce. It had a raspberry flavor to it and won a lot of contests. My friend Ardie Davis of (where else?) Kansas City has authored "The Great BBQ Sauce Book". The book reviews over 300 sauces and has some bow-coo recipes included. I have tried to live with commercial bottled sauces and come away frowning every time. My last major disappointment was with the Kraft line of barbecue sauces. For years I had found Kraft Original met my specifications. Then one day I bought a bottle that was a spitter for sure. Careful reading of the label revealed that the sauce was "new and improved".. You cannot change an original can you? I was upset enough to write the company. For my trouble, I got a coupon worth fifty cents off my next purchase. HEY KRAFT! There wasn't no next purchase. To me, all the sauces pretty much taste alike today. Well, there is the Carolina sauce which doubles as paint and rust remover on old banana boats. The first bottled salad dressing I saw was French Dressing. It was probably made by Kraft. Before that, our salads got mayonnaise on them. I never liked mayonnaise, so salads were not on my menu for years. When I went out in the cold, cruel world and started eating in cafes, I found oil and vinegar dressing. I liked that better than the French. When Thousand Island and Russian dressings came along, I found Thousand Islands to be my favorite. Next came Hidden Valley Ranch dry salad dressing mix in a pouch. You added buttermilk to it to get Ranch dressing. I was not a buttermilk fan, so I never partook, but a lot of people did. It was not long before ready-made Ranch dressing showed up in a bottle. It became very popular. Fact is, today you can go in a big supermarket and find numerous flavors of Ranch dressing. It would not surprise me to fine Ranch-flavored ice cream. A couple of years ago, the original Hidden Valley Ranch people, started encouraging folks to use it dry as seasoning in various things. It just so happens that in the eighties, Cuzin Homer Page was using the dry ranch mix as the secret seasoning in his Chicken Delights. Homer always ran way ahead of the pack. He won a lot of trophies with that secret. For many years the only tropical fruit around was the pineapple. Pineapple has stayed on the favorites list for a long time. Let's throw the banana in there with the pineapple. The kiwi was about the first really exotic tropical fruit to show up on the American dining table, soon to be followed by mangos, guavas and papayas. The availability of the various fruits became an inspiration to trendy chefs. They went into a mix-and-match frenzy. Soon we had things like roast brisket of lamb with mango-lime-chipotle sauce served on papaya rice with farkleberries. The combinations went on forever and the party is still going on. Now we have a new play toy for the masses, the pomegranate, which is native to Iran. It has worked it's way around the world. In Texas, the pomegranate found some favor among the great unwashed as a decorative shrub. It is not an unattractive bush and, in season, has rather attractive red flowers. The fruit of the pomegranate looks like a cross between an apple and a tomato. It has a rather thick skin. Inside there is a jellied mass containing hundreds of seeds. The reddish pulp on the outside of each seed is the editable part. You don't eat the seeds. I don't know of anyone who ever ate a pomegranate. The kids would pick around on them but usually ended up using them for throwing at each other. On the magic chef circuit, the pomegranate is the latest prize. The slick food magazines now have many articles on using pomegranates. They are hyped as having great health benefits. (Anything red is good for you.) So if you want to be on the cutting edge of the latest food trend, go get you a pomegranate. I see them for a buck a piece in the local grocery store.